The Live view displays all of your hardware that SystemDesigner can discover. Each device on the Live diagram represents the configuration of a live or simulated device in your system. Refer to the following image for an example of a device on the Live diagram. Label and sub-label—Information about the device, such as the device name, hostname, model, product family, and serial number. Ports—Connections between devices in your system. Device slots—Controllers, modules and empty slots. Hardware detection type—Glyph that indicates how SystemDesigner discovers the device. The hardware detection type of a device determines whether it appears on the Live diagram automatically. A device can have one of the following hardware detection types. The device automatically appears on the Live diagram. 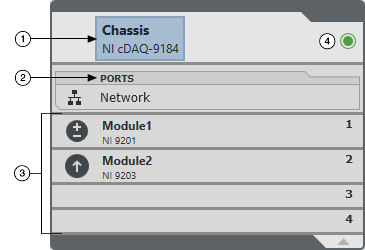 Changes to the live device instantly appear on the Live diagram representation of the device. When the device is unplugged, powered down, or is no-longer reachable, it automatically disappears from the Live diagram. Select the device and click Refresh under the Advanced section on the Item tab. Click Identify Instruments to re-scan for GPIB instruments. When the device is removed from the system, you must manually remove it from the Live diagram. The device does not appear on the Live diagram until you add it manually. Changes to the live device do not apply to the Live diagram device representation. You must manually specify changes in SystemDesigner.